These tunes for kids are southern like grits mixed with the humor of a country gentelman and the schooling of Mr. Rogers, splashed with witty hilarity, sprinkled with just the right amount of quirkiness and topped with entertaining enlightenment. 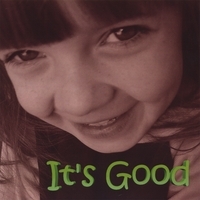 "It's Good" is a CD filled with hilarious and interactive original songs for kids. You can't help but sing, laugh, and dance to the original tunes and lyric's performed by Jeff and Kaitie Ann. The title cut "It's Good" has the kids playing various instruments as they clap, count, laugh, and dance. You'll also love the "Meme Granny Song" written especially for all the grandparents we know and love. In "I Love Cheeseburgers" the kids get to sing about their favorite foods and say "yuck" about their worst foods. Kids will also search high and low as the listen and sing the "I Spy" song. You can't go wrong with a family friendly CD entitled "It's Good". Have Jeff for a concert at your school, library or church. Contact www.bbfuzz.com. Visit Jeff at the BB Fuzz Concert Hall & I Spy Museum located at 2212 Main Street, Porterdale, GA.
TEACHERS: This CD is great for use with lessons on “RHYMING WORDS”. Jeff is a former music teacher at East Newton Elementary located in Covington, Georgia. Jeff and his wife Angie along with their two kids own and operate the BB Fuzz Concert Hall and I Spy Museum located in Porterdale, GA. He holds degrees from the University of Georgia (Bachelor of Music-1989, Master of Music Education -1991) and Piedmont College (Education Specialist - 2003). Jeff is a National Board Certified Teacher (2003) in early and middle childhood music. Jeff was chosen as Newton County Teacher of the Year in 2003 and Covington News "Teacher of the Week" in 2006. His lesson plan "Rap It Up" was published by the Georgia Learning Connections (Georgia Dept. of Education) in 2004. He has been a worship leader at several local churches in Covington and is a founding member of DC318 (An outreach ministry to the youth of Newton County). Jeff is currently the Elementary & Preteen Worship Leader at FBC Conyers, GA and is a member of BMI an American performing rights organization.